Villa Cleese is laid out on one floor. It has 3 bedrooms (all very bright and with large wardrobes), two large bathrooms (one with whirlpool bath and one with shower), a bright living room with a large window and one sofa bed. kitchen is very large and is fully equipped. 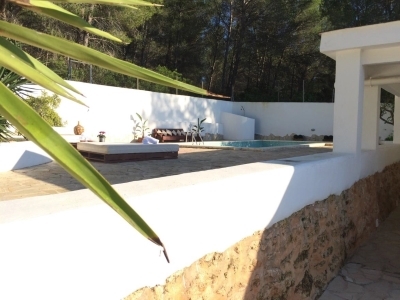 The pool, which is surrounded by trees giving it great privacy is equipped with sun loungers and outdoor shower. Plasma TV in the lounge with internet access. The price includes towels and sheets. Wifi. Bathroom with hairdryer. Air conditioner. Quiet location just 6km from Ibiza, (Marina Botafoch, Pacha y Lío), 3km from Santa Gertrudis, 5Km from San Rafael (Amnesia y Privilege), 8km from Platja d'en Bossa. Also has direct access to Santa Gertrudis bike path. There is a bus stop 20 meters from the house. Check in is from 4.30pm on your arrival day and check out is by 10.30am on your departure day. A refundable security bond of 700 euros is payable on arrival and will be refunded back to guests before departure.